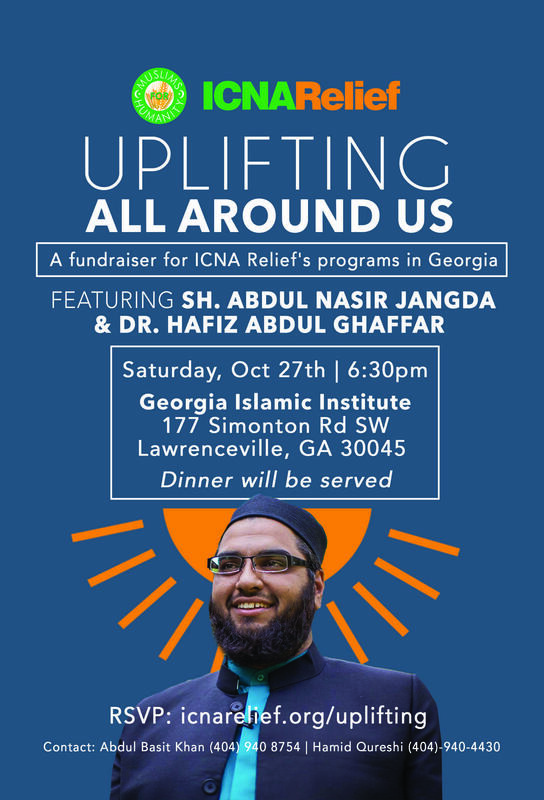 Mark your calender's for Uplifting All Around Us, a fundraiser for ICNA Relief's programs in Georgia. Featuring Sh. Abdul Nasir Jangda and Dr. Hafiz Abdul Ghaffar. Please join us on Saturday, October 27th at 6:30PM at Georgia Islamic Institute, 177 Simonton Road SW Lawrenceville, GA 30045. No tickets required and dinner will be provided. Please RSVP via: icnarelief.org/uplifting. Jzk! Edit This Event Last Edited By: ICNA Relief on Oct. 25, 2018, 3:51 p.m.